Last Thursday night's opening performance of Lorna Littleway's adaptation of scenes from Pearl Cleage's Flyin' West, the first of two poignant, power-punching plays opened my memory book. In another life, my fellow hustler-in-craft, Ajouba gifted me her T shirt, printed with the bold-faced proclamation above. I am now forever grateful to her for unwittingly hitching me to one of the more important pieces in the historical patchwork of American life. In this both humorous and caustic drama, Sophie, Fannie, and Minnie are frontier women and established exodusters in Nicodemus, Kansas, a growing blacktopia in the face of the Jim Crow era. To disrupt their peace enters Frank Charles, an arrogant poet, who's passing ("I let people draw their own conclusions") for white. Newly married to the naïve Minne, a dis in his inheritance coincides with a property gift to his wife, inducing him to coerce her to sell out and move to with him to London. When Sophie surprises Frank in an act of violence, she calls upon her sisters to liberate their youngest sister from domestic slavery. Blues for An Alabama Sky is an intarsia of dreams. However, economics, racism, sexism and homophobia is shredding the fabric. What's the escape route? For Guy, a homosexual costume designer, it's Paris, via Josephine Baker. Angel, a nightclub singer, wants a headline and Delia, a Planned Parenthood advocate, Harlem's first birth control clinic. But the introduction of Leland "Alabama" Cunningham into Angel's life will appliqué a layer of confusion over everyone, his gentle manner veiling a rigid personality unable to cope with the expansive identities emboldened by the renaissance of Harlem's artistic and intellectual movements. Ancestors! This was some of the best work I've seen in a long time. The copiously talented cast under the direction of Rome Neal (Artistic Theater Director, Chairman of the Board of NPC theater program), turned it out! I implore you to get to the Nuyorican Poets Café to buy online tickes for these veritable works of the African-American experience. It's up until April 16th! 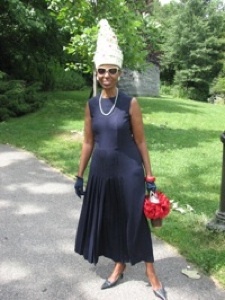 A big shout out to my friends––Pat Floyd, (Law & Order, three time winner of the Golden Earphone awards), Bryan Webster, Co-Producer and Artisitic Director of Sugar Valley Theatricals), The Juneteenth Legacy Theater* and the most fabulous Tom Martin (All My Children, TWAS) who hitched me to the legacy path. *Take a look at a scene from Blues.